Get a degree that adds energy, heat, and light to your career and your life. Physics is the most fundamental science, combining the excitement of experimental discovery with the beauty of mathematics. 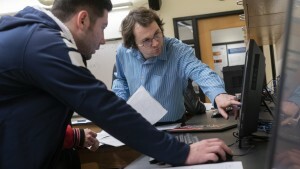 Our majors pursue careers in industrial physics or engineering, as high school teachers, or as researchers in academia. Want to get a job in industrial physics after graduating? According to the American Physical Society, approximately 11.5 million people were employed by U.S. physics-based companies in 2016, and about 70,000 physicists joined industry from 2003-2016, or about 58% of all physics graduates. Want to get a job as an engineer? 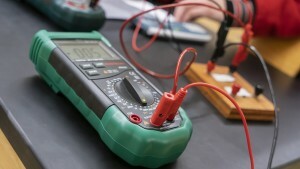 LVC offers a 3+2 engineering program where students can earn a physics degree from LVC (three years) and an engineering degree from Penn State University-University Park or Case Western Reserve University (two years). You will be advised by our faculty along the way. Want to pursue a career in academia? Our professors provide hands-on student-faculty research opportunities in Quantum Information Theory, Laser Modifications of Glass, and Computational Nuclear Physics. There are also opportunities to conduct paid student-faculty research before the start of your first-year through our Research First Program. These experiences can provide great preparation for graduate school. At LVC, you will explore and learn the fundamental laws of nature and the properties of matter, while gaining the critical thinking, writing, and analysis skills employers seek. You’ll gain a hands-on education by working closely with professors in the laboratory, conducting independent study projects, or participating in student-faculty research. Our physics majors pursue careers as physicists, engineers, teachers, technical writers, and medical physicists. Recent graduates have gone on to Penn State University, Georgia Tech, Lehigh University, and the University of Virginia, and a 2016 graduate was named a Fulbright Scholar and studied in Austria. 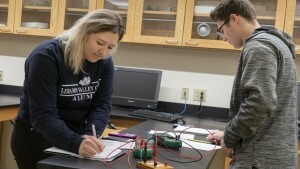 By studying physics at LVC, you'll explore and learn the fundamental laws of nature: motion, force, energy, heat, light, electricity, magnetism, atomic and nuclear structure, and the properties of matter. Receive a hands-on education by working closely with professors in the laboratory as a paid research assistant. Research is a central aspect of the physics major and is supported by departmental funds and external grants. Participate in independent study projects or summer research with professors. Flexible degree requirements make it possible to study abroad and pursue professional internships. 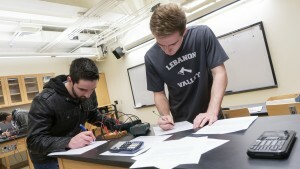 LVC physics majors can earn a B.S. in physics and B.S. in engineering in just five years through the College’s 3+2 Engineering Program (in partnership with Penn State University or Case Western Reserve University). 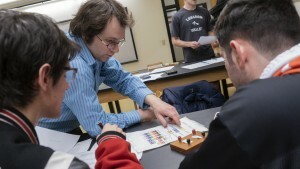 Secondary education teacher certification in physics is available to students who complete the physics major and a complement of courses offered through LVC’s Education Department. 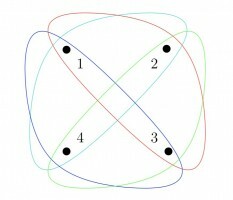 Dr. David Lyons, mathematical sciences, and Dr. Scott Walck, physics, work with students to study the ways in which the "quantum advantage" of systems of entangled particles can perform computing and communications tasks that outperform the most powerful existing supercomputers. 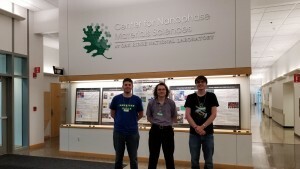 Dr. Keith Veenhuizen, physics and engineering, conducts student-faculty research to fabricate crystals in glass using a laser as a heat source. Light can be guided through the crystals, making them potentially useful as optical interconnects in photonic integrated circuits. Also, the crystals are characterized by various means (Raman spectroscopy, piezoresponse force microscopy, etc.) to gather information for practical applications and more fundamental studies. Dr. Daniel Pitonyak, physics, conducts student-faculty research to map out 3D images of the internal structure of visible matter. 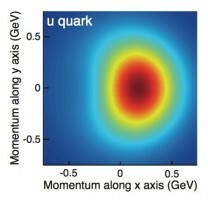 Students write code in Python to compute high-energy particle collisions and analyze how models fit experimental data. 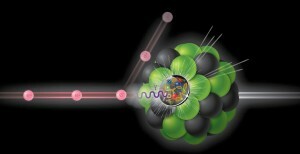 This enables researchers to extract information on the elementary particles that make up objects like the proton. 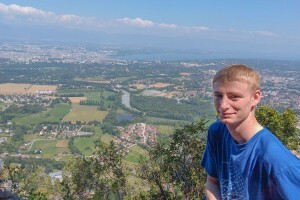 Because of what I learned at LVC, I wasn’t afraid to study something new and jump in to figure it out during my NSF-funded internship at CERN in Switzerland. It was an amazing experience to talk with students from other countries about how they acquire knowledge. Allwein Scholar Justin Cammarota ’19 was one of just 20 students from the United States admitted to a coveted research program at CERN. 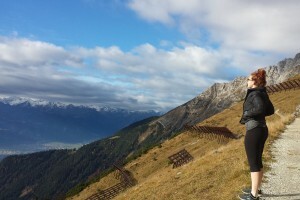 Hannah Pell '16 reflects on her 10 months living and studying in Austria through the Fulbright Program.